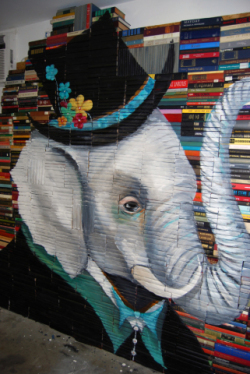 As millions of people go digital in their literary pursuits, the question of what to do with all the traditional books no one is using is certainly worth answering. Donating them to charities, libraries and underprivileged schools comes immediately to mind, but Mike Stilkey has a different idea. 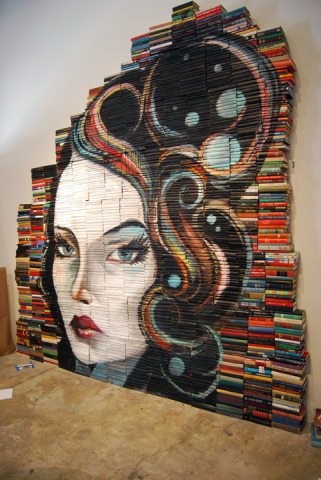 A Day of CelebrationHis unique style utilizes stacks of books as his canvas, creating an art form with extra elements of depth, texture, and meaning that traditional painting may lack. I normally shudder at the idea of even using a book as a coaster, but Stilkey is an enviromentalist, in that he recycles books into new forms of art. And how can I argue with recycling? His subject matter is often whimsical and silly, but tinged with a touch of sadness. Long faces and melancholy eyes are just as frequent as light-hearted scenes that look torn from the pages of a fairy tale. His work holds remnants of Expressionism, like El Greco or Edvard Munch, but also the bizarre and Dali-esque landscapes and scenes of Surrealism. Then, there are certain other images that have a vibrant, yet gritty, feel reminiscent of today's spray-painted street art. Finally, Stilkey's haunting beauty and thought-provoking symbolism might give some art lovers a hint of Chagall's mastery of color and emotional depth. Suffice to say, Stilkey's style is hard to pin down. 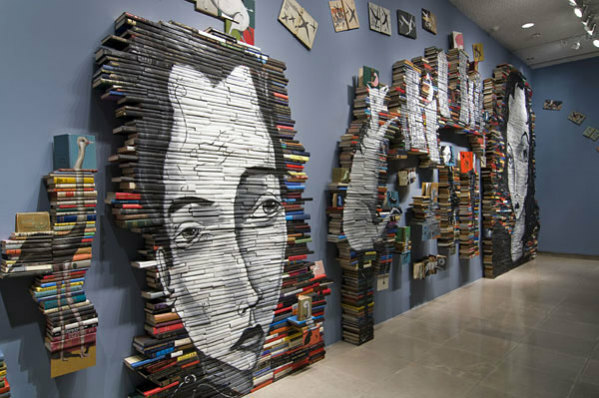 His work ranges from small, playful constructs of less than ten books to massive installments which take more than 10,000 pounds of discarded texts to complete. One of his largest installments to date is now on display as the centerpiece of Hong Kong's Times Square, and stands more than 25 feet tall. His work has been commissioned extensively in China, and he also has a large presence on the west coast of the U.S., where his work has been very well received. What I find most impressive about Stilkey's work is his ability to make meaningful and attractive work in such a wide range of sizes. 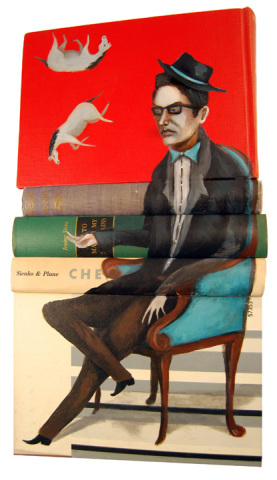 His towering installments are powerful and imposing, but his small, intimate paintings done on canvas sculptures of five or six books are no less engaging to viewers. That sort of flexibility shows a mastery of his craft, and an attention to detail on every scale, regardless of whether the canvas is 7 books, or 7,000. Also, by inventing smaller pieces, collectors don't need to have a blank, 25-foot wall in order to properly display Stilkey's art. Some of the most successful modern artists are those who do things never done before. Other are those who look at what has been done (or what has been written before) and give new life to those old ideas. Mike Stilkey has taken artistic styles of the past and exemplified them on a canvas of materials that might soon be forgotten. And voila! Something new sprung from the old, not to mention something compelling and amusing as well. So, if you have 451 books lying around your house, gathering dust and balancing table legs, send them to Mike Stilkey, who understands that good art never dies - it just changes. 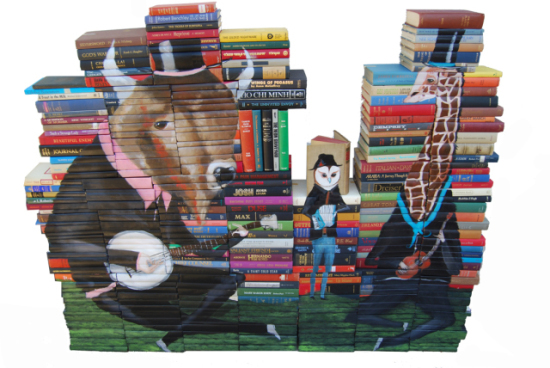 To check out Mike Stilkey's complete collection of whimsical works, visit his gallery. Do you go crazy for cool art? Me too! Explore more of my favorites at Art Outside The Lines. All image rights and copyrights are reserved by the artist.